As I said before March is a crazy birthday month for our family (4 total) but this weekend we are finally having a quiet weekend with no plans other than a Pink Ladybugs 9am soccer game on Saturday and a possible BBQ so . . . I have big plans to finish spraying my Craigslist chairs gold (they are primed and half gold, but I had some bubbling (I think it was too hot the day I sprayed) so I need to go back and sand them again ... ugh) . 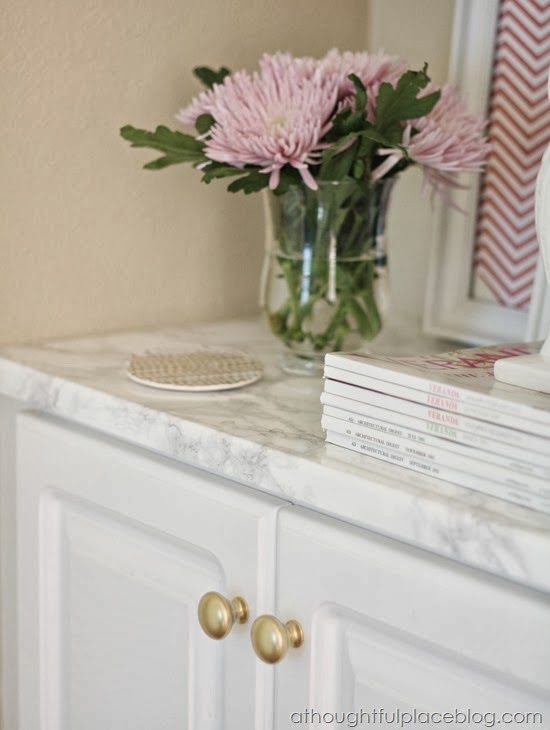 . .
and to tackle an exciting DIY with this marble contact paper!!! Look how great this one turned out . . .
Marble contact paper? Wow! This is perfect for this IKEA toy kitchen hack I've been meaning to do for Connor: http://jesykaditri.com/ikea-play-kitchen-makeover-hack/comment-page-1/ and though it'll look more boyish, I must have that marble countertop look and this is even better than painting a faux marble! I didn't get around to it last weekend (earthquake and all!) but I'll post once i have done it!